Now I ask you, would you buy a used car from any of these guys? Thanks to retired Hamilton police officer Billy Gray for this photo taken 8 years ago at Kuser Park. 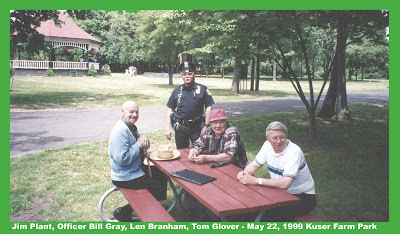 On the left is the late Jim Salt , Officer Bill Gray, the Late Lenny Branham, and on the right, Tom Glover. Yup, just like a melody! 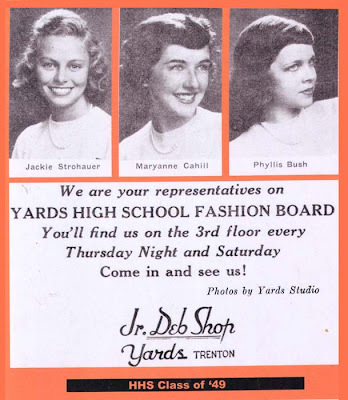 These 3 ladies were members of Yard's Fashion Board. I didn't know Ms. Bush, but the late Maryanne Cahill was in choir with me one year. Jackie Strohauer was movie star beautiful. 1944: "PROFESSOR, HOW COULD YOU?" 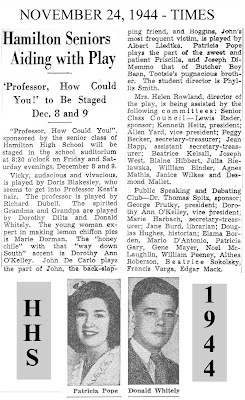 I remember brother Bud talking about this HHS stage presentation back in 1944. This was a production of the class of '45. 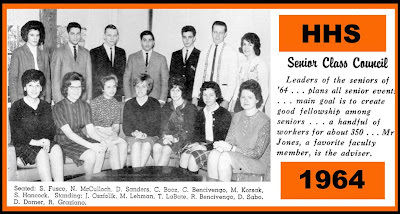 HERE'S A PHOTO OF THE CLASS OF '64 SENIOR COUNCIL. THE LOVELY LADY SEATED THIRD FROM RIGHT IN THE PHOTO IS CAROL BENCIVENGO, SISTER OF MADELINE BENCIVENGO, FAMILIAR TO MANY FOLKS WHO HAVE READ MY LOCAL NEWSPAPER COLUMNS OVER THE PAST 25 YEARS. HER COUSIN RICH IS ALSO IN THE PHOTO. 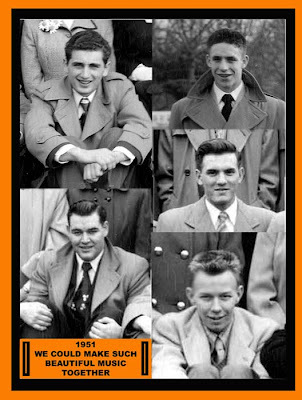 Our friends from the class of '57 have announced the details on their 30th reunion. Have a great time, Hornets! He was another educator who was a strict disciplinarian. 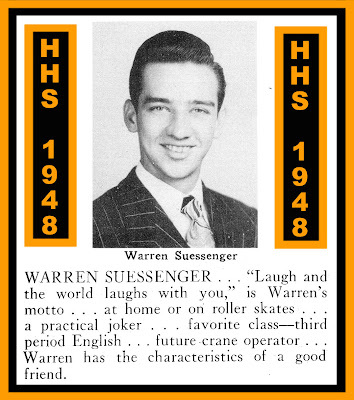 I don't know where it came from, but in my class of 1951, he was known by the rather demeaning nickname, "Jim Crow." Mr. and Mrs. Coursen retired to Elizabethtown, Pennsylvania. Someone sent him one of my columns from the old "Mercer Messenger" wherein I was probably writing one of my "Hamilton High School Diary" columns. He took the time to write to me and tell me he was receiving copies of my column and how much he enjoyed reminiscing about those carefree years. Jim Coursen was the Vice Principal at HHS, and earlier, he was the Principal at the old Kuser Annex. 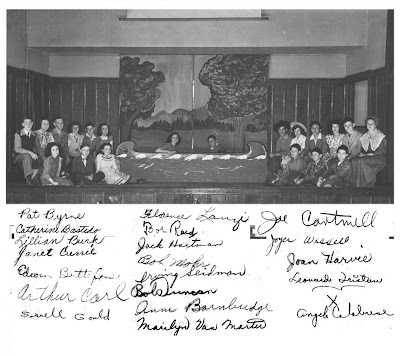 Thanks to Audrey Homan Sperling for this photo of a mystery Kuser School stage production. 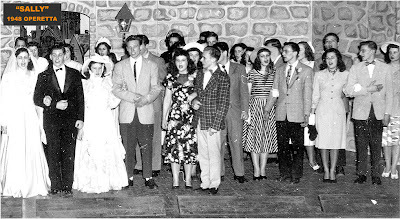 There's Marilyn Van Marter, sister of my Hamilton High Class of '51 classmate Shirley Van Marter, Angelo Calabrese, brother of another HHS '51 classmate, the late Lenny Calabrese, Bob Mohr, brother of still another HHS '51 classmate, Lois Mohr. 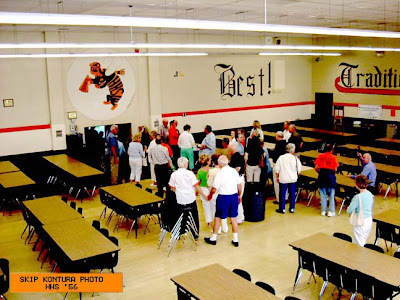 In a week or so, HHS '45 will celebrate still another annual reunion luncheon. This is one of the classes who have managed to keep a very respectable roster of members who still attend the annual affair. I was recently in contact with Harold Gravatt, brother Grace Gravatt. I saw his name somewhere on the web and took a chance that he was the same Harold Gravatt who lived on Kline Avenue. It is. I asked about his sister Grace, and learned that she passed away. Grace was an employee of Kuser School when I was a student there, and a very popular lady with a winning personality. 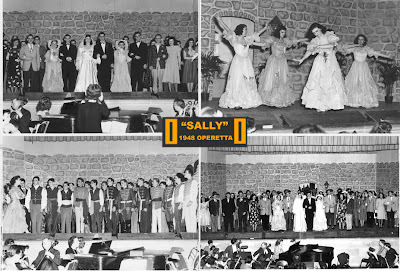 1945: HHS Alumni: Remember the "Operetta?" With the (expletive deleted) noise being pawned of as music here in the 21st century, it is refreshing to realize that many viewers of this site remember "When Music Was Music." 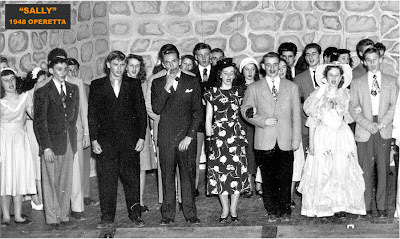 Most of us recall the wonderful years of the high school operetta. 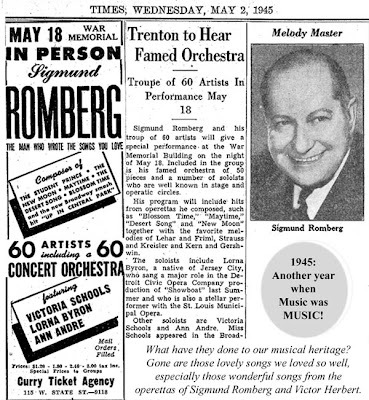 Victor Herbert, Rudolph Friml, and Sigmund Romberg were familiar entities in our musical education. I now have my own collection of computer "midi" files of many of those great old musical presentations and sing them often. 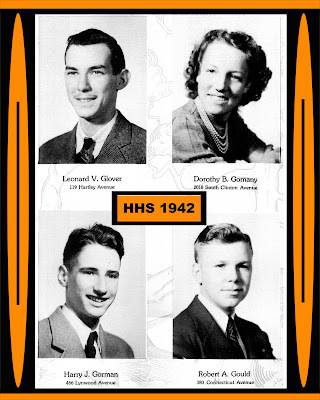 THIS POOR TORN AND TATTERED CLASS PHOTO SHOWS A NUMBER OF THE MEMBERS OF THE HHS CLASS OF 1957. THAT'S MY LITTLE BROTHER DONNIE IN THE THIRD ROW, FIRST PHOTO ON THE LEFT. AND DARNED IF I DON'T SEE LITTLE DONNIE BARGHOLTZ THERE. HE'S THAT CUTE LITTLE FELLER IN THE SAME ROW, TO THE FAR RIGHT, NEXT TO THE BLACK KUSER SCHOOL LABEL. I JUST SIGNED MY GUESTBOOK; NO ONE ELSE WILL! CALLING ALL HORNETS, CALLING ALL HORNETS! YOU AND INCLUDED AS A POST, UNLESS YOU REQUEST ANONYMITY. 1956: ANOTHER CLASS WITH CLASS! 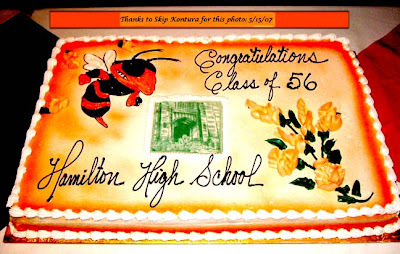 HOW FITTING THAT ANOTHER HHS "CLASS WITH CLASS" WOULD PROVIDE A "CAKE WITH CLASS" FOR THEIR 50TH REUNION. Mmmmm, that sure looks good! CHECK OUT THAT HORNET; GORGEOUS! 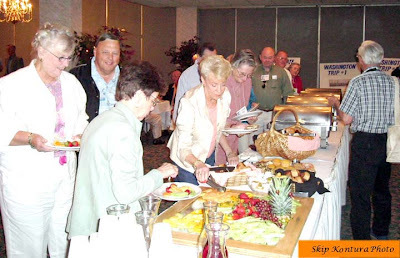 HERE'S A PHOTO OF THE BUFFET TABLE AT THE 50TH REUNION OF THE CLASS OF '56. AS INDICATED IN THE PRECEEDING POST. SOMEONE PLEASE IDENTIFY THE HORNETS IN THIS PHOTO. 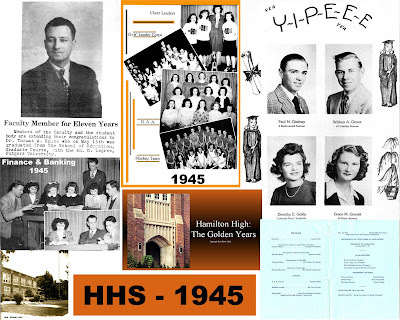 FOR MORE THAN 50 YEARS I HAVE BEEN TOUTING MY HHS CLASS OF '51 AS "THE CLASS WITH CLASS." WELL FOLKS, I'M HERE TO TELL YOU THAT ANOTHER CLASS HAS THAT SAME DISTINCTION: THE CLASS OF 1956; ANOTHER "CLASS WITH CLASS!" THIS MORNING AS I WENT TO MY OFFICE AT HAMILTON LIBRARY'S LOCAL HISTORY COLLECTION, I FOUND A SET OF 2 CD'S FROM SKIP KONTURA WITH INCREDIBLE PHOTOS OF THE 50TH REUNION OF THE CLASS WHICH WAS HELD LAST YEAR. THESE FOLKS WENT ALL OUT TO BRING BACK THE 50'S GENERATION. JUST TAKE A LOOK AT THAT LOVELY LASS PLAYING THE PINBALL MACHINE! THEY EVEN SHOWCASED A '57 CHEVY BELAIRE, AND A '53 PONTIAC SEDAN. I WILL BE POSTING MUCH MORE IN FUTURE POSTS. Thanks so much for your efforts ! 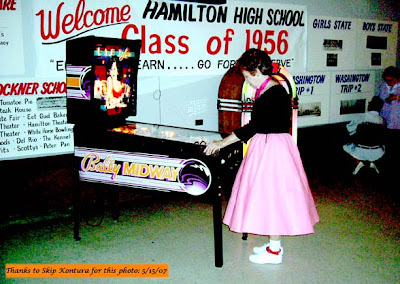 The first photo (NOTE: THE PHOTO ABOVE)you've posted is of Skip's wife, Pat, at the working 50's era pinball machine we rented for the Friday Night Canteen. BTW, if you are of a mind to add a credit line, the Friday Night photos were taken by my former campaign photographer, Larry Krakowitch, who did so gratis. 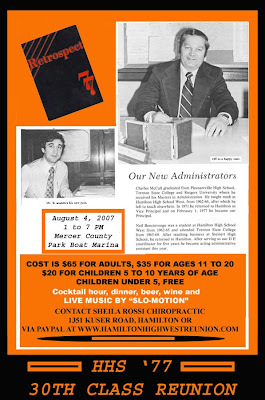 I'm going to print out your blog message and present it tonight at the HHS56 Reunion Committee meeting so that anyone can copy down the blog address. We have a one-night 51st Reunion coming on June 9. The theme this year is "Carnivals-Circuses-State Fairs" and we've been gathering memorabilia from the Hamid Family and others to put on display that night. Tomorrow evening from 7 to 9 PM at Kuser Mansion, we will be remembering the golden years of Hamilton High School before it became "West." This graphic has been created for my brother "Bud" who will join brother Len Glover, Jess Anderson and me as we reminisce about those long ago school years. Public input is invited, so if you are a former Hornet, we would sure like to hear your input. As usual, the program will include musical interludes. Come on out and enjoy. Reservations are necessary. Call 890-3630 and reserve your seat or seats. HERE'S SEGMENTED SCAN 2 OF THE FULL PAGE SCAN WHICH WILL BRING MUCH MORE DETAIL TO THE FULL CAST SCAN OFFERED EARLIER. THE FULL SCAN WAS MUCH TOO SMALL. THANKS AGAIN TO AUDREY HOMAN SPERLING FOR THESE "SALLY"PHOTOS. SCAN 1 IS BELOW. HERE'S SEGMENTED SCAN 1 WHICH WILL BRING MUCH MORE DETAIL TO THE FULL CAST SCAN OFFERED EARLIER. THE FULL SCAN WAS MUCH TOO SMALL. THANKS AGAIN TO AUDREY HOMAN SPERLING FOR THESE "SALLY"PHOTOS. COME CELEBRATE HAMILTON HIGH'S "GOLDEN YEARS"! 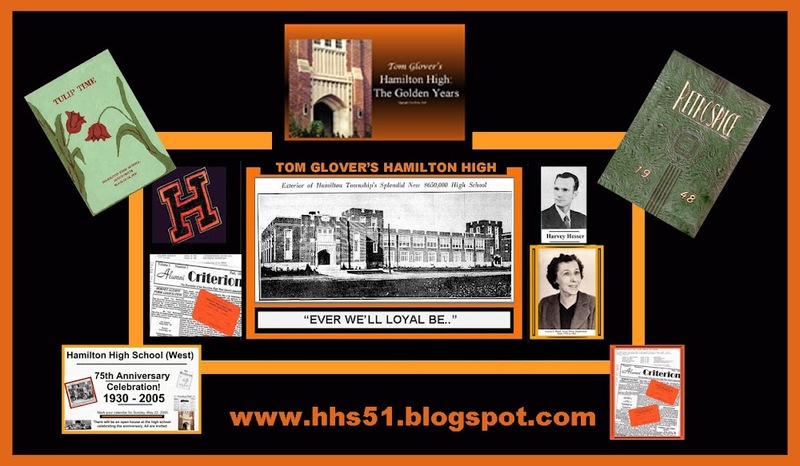 ANY ALUMNI FROM HAMILTON HIGH SCHOOL'S"GOLDEN YEARS" MAY BE INTERESTED IN THE PROGAM WE ARE PRESENTING TUESDAY EVENING (MAY 15, 2007) AT THE KUSER MANSION AT 7:00 PM. BROTHERS LEN AND BUD GLOVER ALONG WITH JESS ANDERSON AND I WILL BE RECALLING HIGH SCHOOL SCHOOL YEARS AS WE LIVED IT IN THE 1930'S, 40'S AND 50’S. 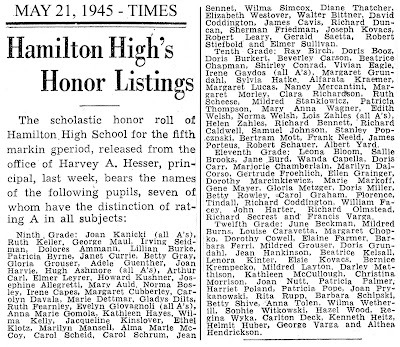 WE WILL RECALL HARVEY HESSER, JIM CROW, “SNEAKY PETE,” “CACTUS JACK,” LOUISE BAIRD, FLORENCE CORNWELL, TOONE TOWN, FIVE HOURS DETENTION, RUSS AYRES’ HOT DOG STAND, RUSS AYRES’ PRIOR’S DONUTS, SMOKING OUT PAST THE 3RD POLE, AND OTHER LONG FORGOTTEN HAMILTON HIGH SCHOOL MEMORIES. IF YOU WERE A HAMILTON HIGH SCHOOL STUDENT ANYWHERE IN THE U.S. DURING THOSE YEARS, YOUR EXPERIENCES WILL BE WELCOME. THIS IS AN INFORMAL COFFEE KLATCH WITHOUT THE COFFEE. AND LEAVE A MESSAGE ON THE KUSER FARM MACHINE. THESE GREAT PHOTOS FROM HHS ALUMNA AUDREY HOMAN SPERLING WERE BROUGHT TO ME AT OUR KUSER SCHOOL PRESENTATION AT KUSER MANSION ON TUESDAY EVENING, MAY 8. I SEE BETTE BEIGER FARMER IN THE UPPER RIGHT PHOTO ALONG WITH PAT BUSH. 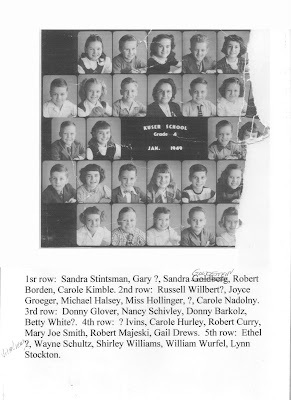 MY CLASS OF '51 CLASSMATE LEE BELARDINO IS ALSO IN THE CAST AND CAN BE SEEN IN THE CAST PHOTOS. LIKE THE OPERETTA "SALLE," THESE PHOTOS ARE A TREASURE. I WILL TRY TO ENHANCE THE FULL LENGTH CAST PHOTOS, EVEN IF THEY HAVE TO BE SEGMENTED. VIC SUESSENGER (WITH AN "N" WAS OUR 119 HARTLEY AVENUE NEIGHBOR BACK IN THE 1940'S. VIC BROUGHT A NEW METHOD OF KILLING CHICKENS TO THE NEIGHBORHOOD. THE GLOVERS STRUNG THE CHICKENS UP ON THE CLOTHES LINE AND KILLED THEM. THE SLABICKIS USED THE AXE AND CHOPPING BLOCK. 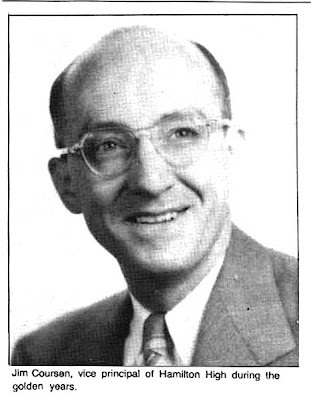 VIC SUSSENGER USED AN ICE PICK. I WON'T GO INTO THE GORY DETAILS ON ANY OF THOSE METHODS OF EXECUTION, BUT THAT WAS RURAL LIFE IN THE 1940'S. I LOVED THESE GUYS! WE WERE ALL PART OF THE BOYS' GROUP WHO PERFORMED SOME OF THE MOST INCREDIBLY BEAUTIFUL HARMONY YOU EVER HEARD. 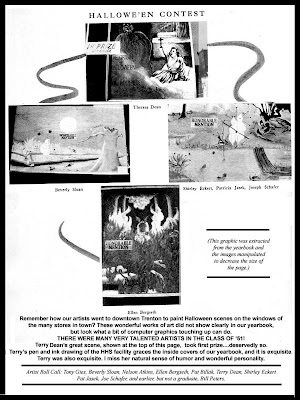 UPPER LEFT IS LEE BELARDINO, TOP RIGHT KIETH KAUFFMAN, LOWER LEFT BILL BAGGOTT, LOWER RIGHT CLARK PERRY, AND BRINGING UP THE REAR IN THE LOWER RIGHT, YOURS TRULY, TOM GLOVER. I REPEAT. OUR VOCAL HARMONY WAS SUPERB! I SENT A COPY OF THIS POST TO 3 OUT OF 4 OF OUR LATE, LAMENTED BOYS' QUARTET IN THE CLASS OF '51. THIS RESPONSE FROM LEE BELARDINO, AND YES, HE IS STILL SINGING. HOW WELL I REMEMBER HIS TENOR HARMONIZING WITH BILLY BAGGOTT'S! Great shots. were we ever that young? My grandaughters couldn't even recognize me. We were the best and you were the bestest.I visit your site daily. How I wish I could go to your Kuser singalongs. We had the best songs because we were the greatest generation with the greatest teacher. Incidentally,I am a member of a senior Ukelele club. There are about 30 members and we play and sing all the old favorites like Sentmental Journey,For Me and My Gal, Anytime. etc., and a lot of Hawaiin songs. We perform at nursing homes,senior park lua's, etc. I can't play too well but they accepted me for my singing .It pays to be a former Louise Baird student. Those four years at HHS in music class with her are etched in my soul for ever. Keep it up Tom because you are a constant reminder of the best times of my life.